On November 8th, 2017, 25,000 people from diverse industrysectors gathered at the Boston Convention and Exhibition Center for Greenbuild International Conference and Expo. 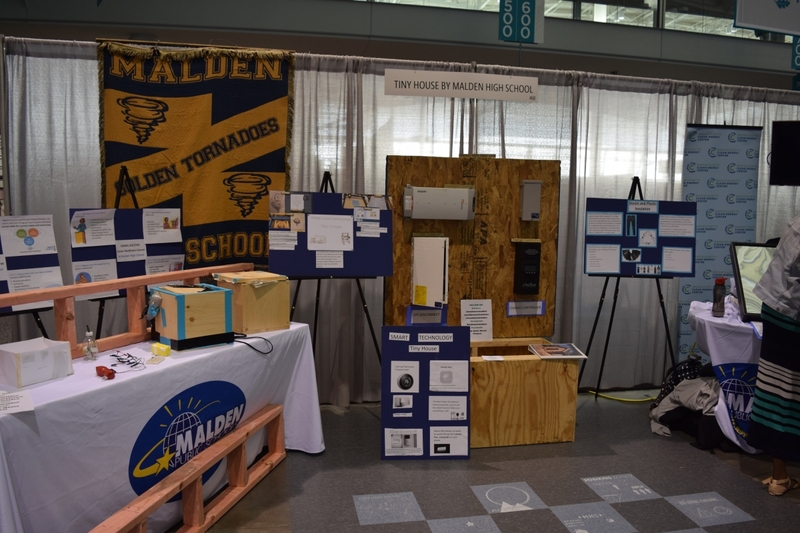 MassCEC exhibited our clean heating and cooling rebate programs as well as Malden High School’s Tiny House project funded by a MassCEC Learn and Earn grant. Enthusiastic students spoke to architects, building owners, educators, and other professionals about the process of building the tiny house and the coursework they completed. Artifacts on display included personally engraved tiles that will soon make up the floor of the 8’ x 10’ tiny house, a scale model of the house including functioning solar panels, and a “smart” mirror that the students coded to display the weather and time. The expo floor was filled with exhibitors showcasing everything from home fixtures to virtual reality (VR) demonstrations for use in architecture. Putting on VR goggles allowed you to experience a new performing arts center at a university. A green structure that looked like trees held “central park” where you could pedal on a stationary bicycle to charge your cell phone. Large orange scaffolding marked the ABX expo, an annual exposition from the Boston Society of Architects which coincided with the traveling Greenbuild conference. MassCEC employees attended several interesting sessions outside of the expo hall on topics including sustainability in multi-family homes,affordable public housing and net zero building. Additionally, Andrew Chabot, Senior Program Manager of Workforce Development gave a presentation on the MassCEC Clean Energy Internship Program titled “Internships: Creating a Talent Pipeline for Green Industries.” It was a fantastic opportunity for Massachusetts to host the largest conference on green building and to demonstrate our strong presence in the industry.